27 February 2017 Unlocked content from the archive. Kirby Arrow and her best friend Clancy Lee are the only two 17-year-olds in their tiny town. Clancy wants to leave as soon as possible, but Kirby is determined to stay: she’ll learn how to be a carpenter and she’ll help take care of her lost and forgetful grandfather. Then Kirby sees a photo of her estranged father in the newspaper and Iris, a beautiful girl her own age, moves to town. And new possibilities begin to open up. Night Swimming is a sweet and, for the most part, low-key story of coming of age, family and first requited love. Kirby’s home is a small but entirely 21st-century rural Australian town, and feels immediately authentic. There is a genuine-feeling desire in both Kirby and the story to see the good intentions in lightly sketched but complex characters, which gives the book a lot of heart. Kirby’s distress over her grandfather’s declining memory is poignant and sensitively portrayed. And the love story is very sweet, although there is a lot about why Kirby likes Iris and little to show why Iris likes Kirby so much, which does give it a slight feeling of wish fulfilment. 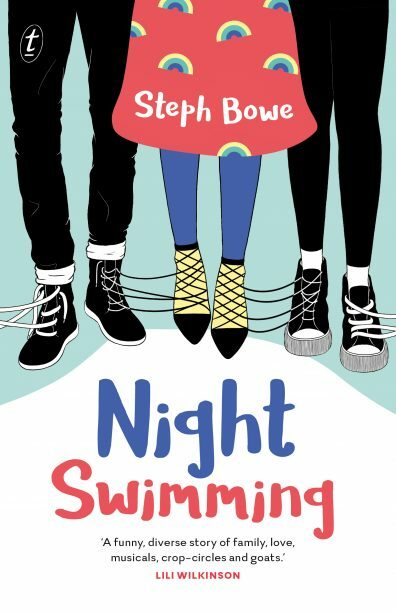 Night Swimming will appeal to fans of realistic Australian YA and to readers searching for sweet and hopeful queer love stories.